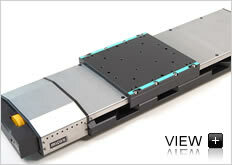 The linear precision positioning stage LS-180 was developed for industrial applications. Re-circulating ball guides mounted on rigid tempered aluminum-alloy guarantee a very high guiding stiffness and long life. The ball screw with 5 mm pitch allows velocities up to 200 mm/s. For demanding positioning tasks the linear stages LS-180 can be supplied with a linear scale which is centrally installed between the guides. Linear stages LS-180 can be equipped with a DC or a 2-phase stepper motor and are equipped with two mechanical limit switches.